Award: Award for Excellance in Concrete Construction, ACI Concrete. 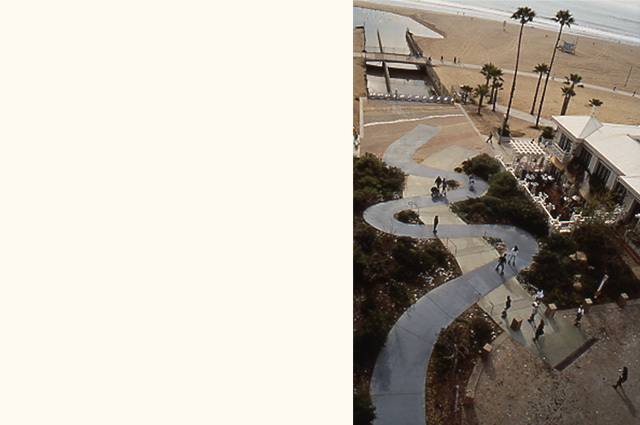 Located at the terminus of Pico Boulevard and Santa Monica Beach, California Wash: A Memorial enhances the aesthetic environment of one of Santa Monica’s most vital tourist areas by creating new public space along the highly developed oceanfront. This narrative work of art recreates the image of a California coastal wash echoing the ecology that once existed from Mandeville Canyon to the beach. 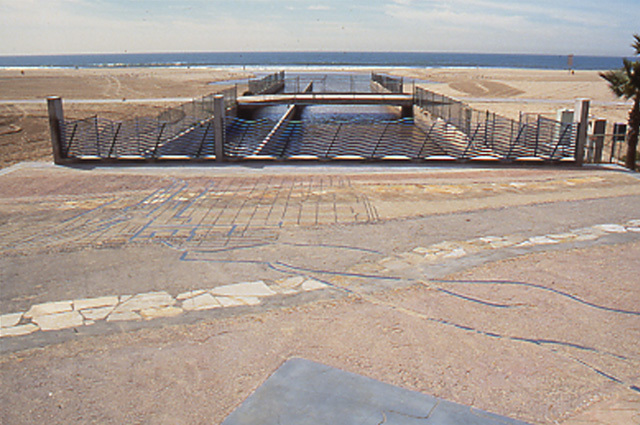 Consisting of a poured concrete section of Pico Boulevard; a fully landscaped median strip and sycamore lined sidewalks; public access from Pico Boulevard to the beach surrounded by gardens replete with native grasses, flowers and trees; and on the promenade, an inlaid mural that maps the project and illustrates the flora and fauna of the wash.